Using this method provides you with nearly limitless color possibilities. Our printer uses a 6 color process that enables us to produce solid colored text and shapes as well as multi colored images such as photos and illustrations. 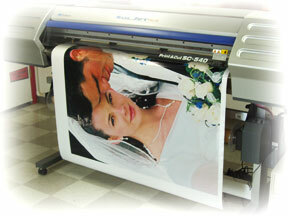 Prints can also be cut to custom shapes where a simple rectangle background shape won't meet your needs.